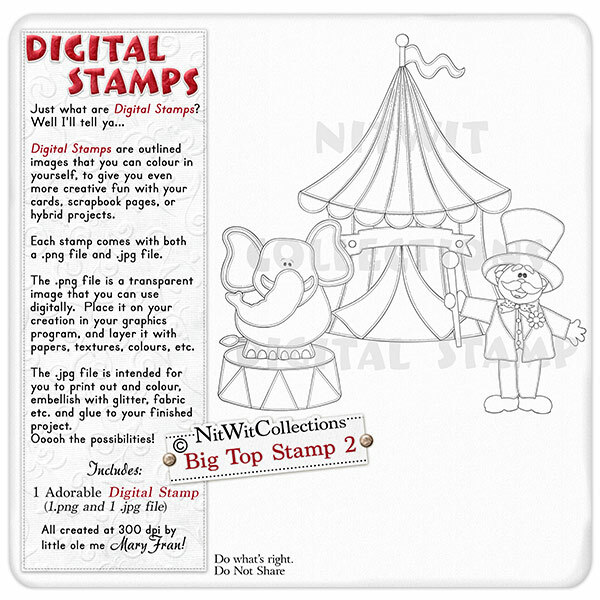 Big Top Digital Stamp 2 is the quintessential circus scene. Ah the Big Top, weren't we all destined to be in lights! !ha,ha I hope that you can find a bag of peanuts for eating while capturing your circus memories. The choice is yours with this digital stamp. A great creative addition for your card making, scrapbooking, and hybrid scrapbooking projects. 1 Circus Scene Stamp (2 files - 1 image is a .png file and 1 is a .jpg file format).